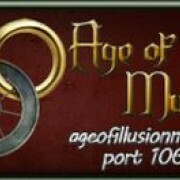 Set in the time before The Dragon Reborn has revealed himself, Age of Illusion offers players a place to enjoy themselves. Nobility across the world plays the game of houses. The Aes Sedai plot, the Wheel turns. Where are you? Guilds such as Darkfriend, Shadowspawn, White Tower, Borderguard, Black Tower (when RP opens it up). Custom leveling: Channelers choose what they would like their powers to be. (Want to be a female channeler who has a bit of power in fire? Just add more power to your fire sphere). No two channelers are the same--power is randomly generated based on what you put in your spheres, the higher number you put in, the more powerful it will be. Talents: We offer Cloud Dancing, Foretelling, Traveling, Dreaming, Wolfkin (Perrin, Elyas), Viewing (Think Min) Sniffing (Hurin) and many more. RP: We have a great RP system. Emote (normal) Smote (same as emote, but you don't have to start the emote with your name) and many more commands. If you have your RP flag on, you get autorewards for emotes in both questpoints and experience.